I don’t know who Amar Bhide (apologies for not being able to insert an accent over the “e” in his last name) is, but Edmund Phelps is certainly an eminent economist and a deserving recipient of the 2006 Nobel Prize in economics. Unfortunately, Professor Phelps attached his name to an op-ed in Wednesday’s Wall Street Journal, co-authored with Bhide, consisting of little more than a sustained, but disjointed, rant about the Fed and central banking. I am only going to discuss that first part of the op-ed that touches on the monetary theory of increasing the money supply through open-market operations, and about the effect of that increase on inflation and inflation expectations. Bhide and Phelps not only get the theory wrong, they seem amazingly oblivious to well-known facts that flatly contradict their assertions about monetary policy since 2008. Let’s join them in their second paragraph. Monetary policy might focus on the manageable task of keeping expectations of inflation on an even keel—an idea of Mr. Phelps’s [yes that same Mr. Phelps whose name appears as a co-author] in 1967 that was long influential. That would leave businesses and other players to determine the pace of recovery from a recession or of pullback from a boom. Nevertheless, in late 2008 the Fed began its policy of “quantitative easing”—repeated purchases of billions in Treasury debt—aimed at speeding recovery. “QE2” followed in late 2010 and “QE3” in autumn 2012. One can’t help wondering what planet Bhide and Phelps have been dwelling on these past four years. To begin with, the first QE program was not instituted until March 2009 after the target Fed funds rate had been reduced to 0.25% in December 2008. Despite a nearly zero Fed funds rate, asset prices, which had seemed to stabilize after the September through November crash, began falling sharply again in February, the S&P 500 dropping from 869.89 on February 9 to 676.53 on March 9, a decline of more than 20%, with inflation expectations as approximated, by the TIPS spread, again falling sharply as they had the previous summer and fall. Apart from their confused chronology, their suggestion that the Fed’s various quantitative easings have somehow increased inflation and inflation expectations is absurd. Since 2009, inflation has averaged less than 2% a year – one of the longest periods of low inflation in the entire post-war era. Nor has quantitative easing increased inflation expectations. The TIPS spread and other measures of inflation expectations clearly show that inflation expectations have fluctuated within a narrow range since 2008, but have generally declined overall. The graph below shows the estimates of the Cleveland Federal Reserve Bank of 10-year inflation expectations since 1982. The chart shows that the latest estimate of expected inflation, 1.65%, is only slightly above its the low point, reached in March, over the past 30 years. 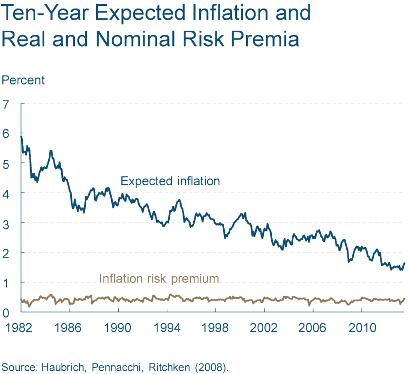 Thus expected inflation is now below the 2% target rate that the Fed has set. And to my knowledge Professor Phelps has never advocated targeting an annual inflation rate less than 2%. So I am unable to understand what he is complaining about. There are three really serious problems with this passage. First, and most obvious to just about anyone who has not been asleep for the last four years, central-bank purchases have not put the price level on a higher path than it was on before 2008; the rate of inflation has clearly fallen since 2008. Or would Bhide and Phelps have preferred to allow the deflation that briefly took hold in the fall of 2008 to have continued? I don’t think so. But if they aren’t advocating deflation, what exactly is their preferred price level path? Between zero and 1.5% perhaps? Is their complaint that the Fed has allowed inflation to be a half a point too high for the last four years? Good grief. Second, Bhide and Phelps completely miss the point of the Metzler paper (“Wealth, Saving and the Rate of Interest”), one of the classics of mid-twentieth-century macroeconomics. (And I would just mention as an aside that while Metzler was indeed at the University of Chicago, he was the token Keynesian in the Chicago economics department in 1940s and early 1950s, until his active career was cut short by a brain tumor, which he survived, but with some impairment of his extraordinary intellectual gifts. Metzler’s illness therefore led the department to hire an up-and-coming young Keynesian who had greatly impressed Milton Friedman when he spent a year at Cambridge; his name was Harry Johnson. Unfortunately Friedman and Johnson did not live happily ever after at Chicago.) The point of the Metzler paper was to demonstrate that monetary policy, conducted via open-market operations, could in fact alter the real interest rate. Money, on Metzler’s analysis, is not neutral even in the long run. The conclusion was reached via a comparative-statics exercise, a comparison of two full-employment equilibria — one before and one after the central bank had increased the quantity of money by making open-market purchases. The motivation for the exercise was that some critics of Keynes, arguing that deflation, at least in principle, could serve as a cure for involuntary unemployment — an idea that Keynes claimed to have refuted — had asserted that, because consumption spending depends not only on income, but on total wealth, deflation, by increasing the real value of the outstanding money stock, would actually make households richer, which would eventually cause households to increase consumption spending enough to restore full employment. Metzler argued that if consumption does indeed depend on total wealth, then, although the classical proposition that deflation could restore full employment would be vindicated, another classical proposition — the invariance of the real rate of interest with respect to the quantity of money — would be violated. So Metzler’s analysis — a comparison of two full-employment equilbria, the first with a lower quantity of money and a higher real interest rate and the second with a higher quantity of money and lower real interest rate – has zero relevance to the post-2008 period, in which the US economy was nowhere near full-employment equilibrium. Finally, Bhide and Phelps, mischaracterize Metzler’s analysis. Metzler’s analysis depends critically on the proposition that the reduced real interest rate caused by monetary expansion implies an increase in household wealth, thereby leading to increased consumption. It is precisely the attempt to increase consumption that, in Metzler’s analysis, entails an inflationary gap that causes the price level to rise. But even after the increase in the price level, the real value of household assets, contrary to what Bhide and Phelps assert, remains greater than before the monetary expansion, because of a reduced real interest rate. A reduced real interest rate implies an increased real value of the securities retained by households. Under Metzler’s analysis, therefore, if the starting point is a condition of less than full employment, increasing the quantity of money via open-market operations would tend to increase not only household wealth, but would also increase output and employment relative to the initial condition. So it is also clear that, on Metzler’s analysis, apparently regarded by Bhide and Phelps as authoritative, the problem with Fed policy since 2008 is not that it produced too much inflation, as Bhide and Phelps suggest, but that it produced too little. If it seems odd that Bhide and Phelps could so totally misread the classic paper whose authority they invoke, just remember this: in the Alice-in-Wonderland world of the Wall Street Journal editorial page, things aren’t always what they seem. The Labor Department announced today that the US economy added (a better-than-expected) 195,000 new jobs in June, while also revising upwards its estimates of job growth in April and May. Good news, right? Yes, it was good new, but there was also bad news. What was the bad news? Why, it was the good news, of course! One hour after the Labor Department announcement, the NYSE opened with the S&P 500 10 points above its Wednesday close, and immediately started to fall. 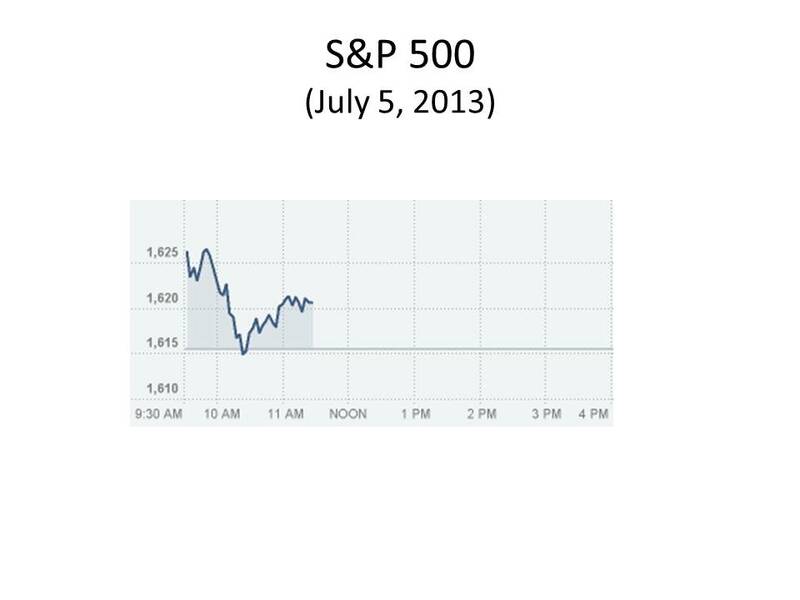 Here’s a picture of the S&P 500 so far today. What happened? The good news about job creation signals a strengthening economy that could be poised to start a real recovery as opposed to the pseudo-recovery of the past four years. But, as I explained last week, thanks to the Fed’s promise to start tapering off its asset purchases as soon as the economy starts to improve, the market now greets good news with fear and trepidation. So the good news about the economy is cancelled out by the bad news about Fed policy. That explains why the yield on the 10-year Treasury note shot up this morning by 20 basis points today to its highest level in two years. 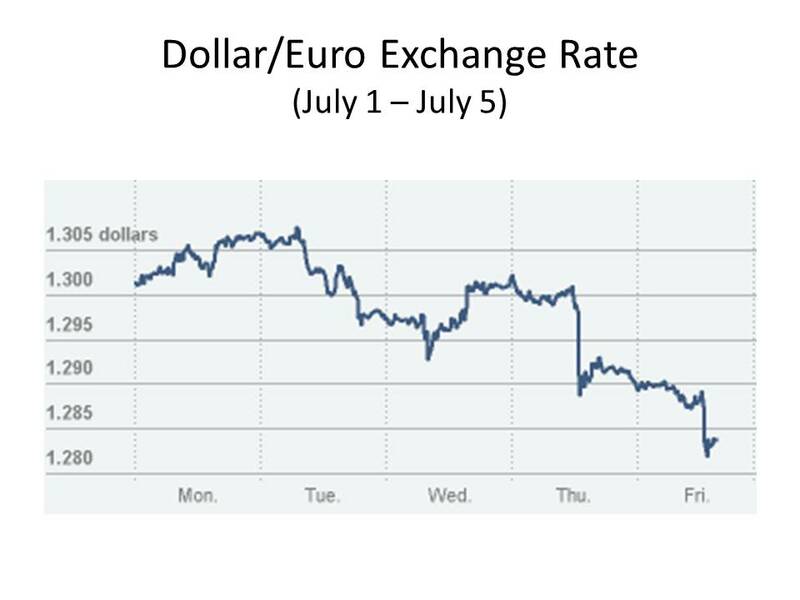 And here’s a picture of what happened to the dollar/euro exchange rate today after the jobs announcement. Well the sky is not falling — yet. But I just don’t know how much more good news like this the economy can stand. Who Sets the Real Rate of Interest? where i is the nominal rate, r is the real rate, and dP/dt is the rate of inflation. It is important to bear in mind that the Fisher equation can be understood in two very different ways. It can either represent an ex ante relationship, with dP/dt referring to expected inflation, or it can represent an ex post relationship, with dP/dt referring to actual inflation. What I want to discuss in this post is the tacit assumption that usually underlies our understanding, and our application, of the ex ante version of the Fisher equation. There are three distinct variables in the Fisher equation: the real and the nominal rates of interest and the rate of inflation. If we think of the Fisher equation as an ex post relationship, it holds identically, because the unobservable ex post real rate is defined as the difference between the nominal rate and the inflation rate. The ex post, or the realized, real rate has no independent existence; it is merely a semantic convention. But if we consider the more interesting interpretation of the Fisher equation as an ex ante relationship, the real interest rate, though still unobservable, is not just a semantic convention. It becomes the theoretically fundamental interest rate of capital theory — the market rate of intertemporal exchange, reflecting, as Fisher masterfully explained in his canonical renderings of the theory of capital and interest, the “fundamental” forces of time preference and the productivity of capital. Because it is determined by economic “fundamentals,” economists of a certain mindset naturally assume that the real interest rate is independent of monetary forces, except insofar as monetary factors are incorporated in inflation expectations. But if money is neutral, at least in the long run, then the real rate has to be independent of monetary factors, at least in the long run. So in most expositions of the Fisher equation, it is tacitly assumed that the real rate can be treated as a parameter determined, outside the model, by the “fundamentals.” With r determined exogenously, fluctuations in i are correlated with, and reflect, changes in expected inflation. Now there’s an obvious problem with the Fisher equation, which is that in many, if not most, monetary models, going back to Thornton and Wicksell in the nineteenth century, and to Hawtrey and Keynes in the twentieth, and in today’s modern New Keynesian models, it is precisely by way of changes in its lending rate to the banking system that the central bank controls the rate of inflation. And in this framework, the nominal interest rate is negatively correlated with inflation, not positively correlated, as implied by the usual understanding of the Fisher equation. 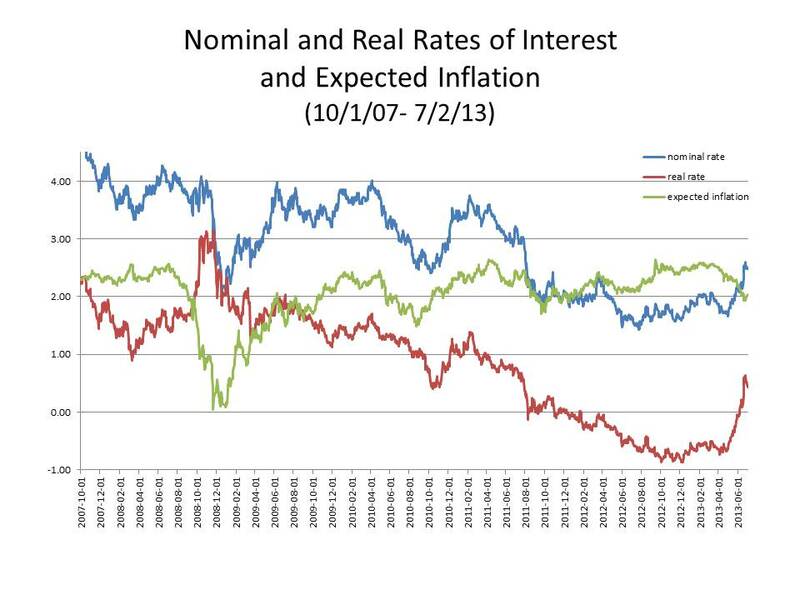 Raising the nominal interest rate reduces inflation, and reducing the nominal interest rate raises inflation. The conventional resolution of this anomaly is that the change in the nominal interest rate is just temporary, so that, after the economy adjusts to the policy of the central bank, the nominal interest rate also adjusts to a level consistent with the exogenous real rate and to the rate of inflation implied by the policy of the central bank. The Fisher equation is thus an equilibrium relationship, while central-bank policy operates by creating a short-term disequilibrium. But the short-term disequilibrium imposed by the central bank cannot be sustained, because the economy inevitably begins an adjustment process that restores the equilibrium real interest rate, a rate determined by fundamental forces that eventually override any nominal interest rate set by the central bank if that rate is inconsistent with the equilibrium real interest rate and the expected rate of inflation. It was just this analogy between the powerlessness of the central bank to hold the nominal interest rate below the sum of the exogenously determined equilibrium real rate and the expected rate of inflation that led Milton Friedman to the idea of a “natural rate of unemployment” when he argued that monetary policy could not keep the unemployment rate below the “natural rate ground out by the Walrasian system of general equilibrium equations.” Having been used by Wicksell as a synonym for the Fisherian equilibrium real rate, the term “natural rate” was undoubtedly adopted by Friedman, because monetarily induced deviations between the actual rate of unemployment and the natural rate of unemployment set in motion an adjustment process that restores unemployment to its “natural” level, just as any deviation between the nominal interest rate and the sum of the equilibrium real rate and expected inflation triggers an adjustment process that restores equality between the nominal rate and the sum of the equilibrium real rate and expected inflation. So, if the ability of the central bank to use its power over the nominal rate to control the real rate of interest is as limited as the conventional interpretation of the Fisher equation suggests, here’s my question: When critics of monetary stimulus accuse the Fed of rigging interest rates, using the Fed’s power to keep interest rates “artificially low,” taking bread out of the mouths of widows, orphans and millionaires, what exactly are they talking about? The Fed has no legal power to set interest rates; it can only announce what interest rate it will lend at, and it can buy and sell assets in the market. It has an advantage because it can create the money with which to buy assets. But if you believe that the Fed cannot reduce the rate of unemployment below the “natural rate of unemployment” by printing money, why would you believe that the Fed can reduce the real rate of interest below the “natural rate of interest” by printing money? Martin Feldstein and the Wall Street Journal believe that the Fed is unable to do one, but perfectly able to do the other. Sorry, but I just don’t get it. Look at the accompanying chart. It tracks the three variables in the Fisher equation (the nominal interest rate, the real interest rate, and expected inflation) from October 1, 2007 to July 2, 2013. To measure the nominal interest rate, I use the yield on 10-year Treasury bonds; to measure the real interest rate, I use the yield on 10-year TIPS; to measure expected inflation, I use the 10-year breakeven TIPS spread. The yield on the 10-year TIPS is an imperfect measure of the real rate, and the 10-year TIPS spread is an imperfect measure of inflation expectations, especially during financial crises, when the rates on TIPS are distorted by illiquidity in the TIPS market. Those aren’t the only problems with identifying the TIPS yield with the real rate and the TIPS spread with inflation expectations, but those variables usually do provide a decent approximation of what is happening to real rates and to inflation expectations over time. Before getting to the main point, I want to make a couple of preliminary observations about the behavior of the real rate over time. First, notice that the real rate declined steadily, with a few small blips, from October 2007 to March 2008, when the Fed was reducing the Fed Funds target rate from 4.75 to 3% as the economy was sliding into a recession that officially began in December 2007. The Fed reduced the Fed Funds target to 2% at the end of April, but real interest rates had already started climbing in early March, so the failure of the FOMC to reduce the Fed Funds target again till October 2008, three weeks after the onset of the financial crisis, clearly meant that there was at least a passive tightening of monetary policy throughout the second and third quarters, helping create the conditions that precipitated the crisis in September. The rapid reduction in the Fed Funds target from 2% in October to 0.25% in December 2008 brought real interest rates down, but, despite the low Fed Funds rate, a lack of liquidity caused a severe tightening of monetary conditions in early 2009, forcing real interest rates to rise sharply until the Fed announced its first QE program in March 2009. I won’t go into more detail about ups and downs in the real rate since March 2009. Let’s just focus on the overall trend. From that time forward, what we see is a steady decline in real interest rates from over 2% at the start of the initial QE program till real rates bottomed out in early 2012 at just over -1%. So, over a period of three years, there was a steady 3% decline in real interest rates. This was no temporary phenomenon; it was a sustained trend. I have yet to hear anyone explain how the Fed could have single-handedly produced a steady downward trend in real interest rates by way of monetary expansion over a period of three years. To claim that decline in real interest rates was caused by monetary expansion on the part of the Fed flatly contradicts everything that we think we know about the determination of real interest rates. Maybe what we think we know is all wrong. But if it is, people who blame the Fed for a three-year decline in real interest rates that few reputable economists – and certainly no economists that Fed critics pay any attention to — ever thought was achievable by monetary policy ought to provide an explanation for how the Fed suddenly got new and unimagined powers to determine real interest rates. Until they come forward with such an explanation, Fed critics have a major credibility problem. So please – please — Wall Street Journal editorial page, Martin Feldstein, John Taylor, et al., enlighten us. We’re waiting. PS Of course, there is a perfectly obvious explanation for the three-year long decline in real interest rates, but not one very attractive to critics of QE. Either the equilibrium real interest rate has been falling since 2009, or the equilibrium real interest rate fell before 2009, but nominal rates adjusted slowly to the reduced real rate. The real interest rate might have adjusted more rapidly to the reduced equilibrium rate, but that would have required expected inflation to have risen. What that means is that sometimes it is the real interest rate, not, as is usually assumed, the nominal rate, that adjusts to the expected rate of inflation. My next post will discuss that alternative understanding of the implicit dynamics of the Fisher equation.